Amazon Price: $79.99 $61.79 You save: $18.20 (23%). (as of February 2, 2019 7:55 am – Details). Product prices and availability are accurate as of the date/time indicated and are subject to change. Any price and availability information displayed on the Amazon site at the time of purchase will apply to the purchase of this product. Not a domo, but when we saw these we fell in love! This giant teddy bear is waiting to be adopted into your family! This big guy is 30 inches tall when sitting, and 36 when standing. This plush teddy bear is very soft and lovable, easy to hug and a joy to be around! Everything you need comes right in the box, shipped directly to you! Just open the box and watch the smiles and laughter as your new family member lights up the room! This soft and sturdy bear is built well, and is a very huggable, giant stuffed animal. 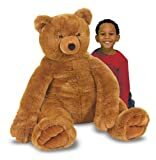 Children can either carry, hug or use him for a pillow making this giant teddy bear very versatile! His thick, soft hair make him a great companion to children and adults alike! If you are more into life-like teddy bears, you may like this black bear. He is cuddly and soft, but has realistic marking. This bear would like great as a decoration, or as a lovable, huggable friend!